For the 4th of July, I thought nothing would be more American than a chocolate-chip cookie cake. I have been playing around with making ghee (clarified butter) and found this recipe for a brown butter cake, which uses a similar process. 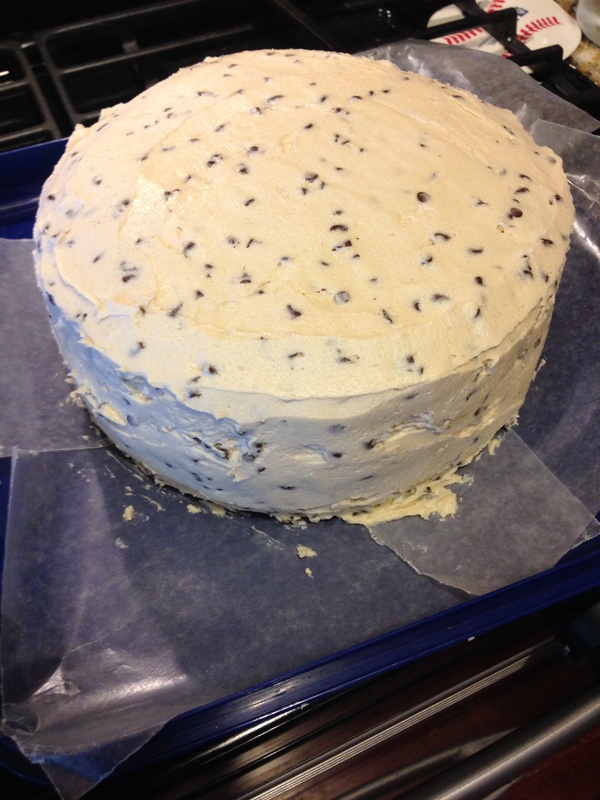 Then, why not top the cake with chocolate-chip cookie dough frosting? And for good measure, top that off with some chocolate ganache. These colors don’t run. This was a really nice cake and definitely hit the spot post-BBQ. Next time, I will use a vanilla bean while preparing the brown butter, and I will actually let the brown butter solidify before preparing the cake (for some reason, I skipped over that direction in the source recipe). I also think I would put the ganache between cake layers instead of using it as a topping. 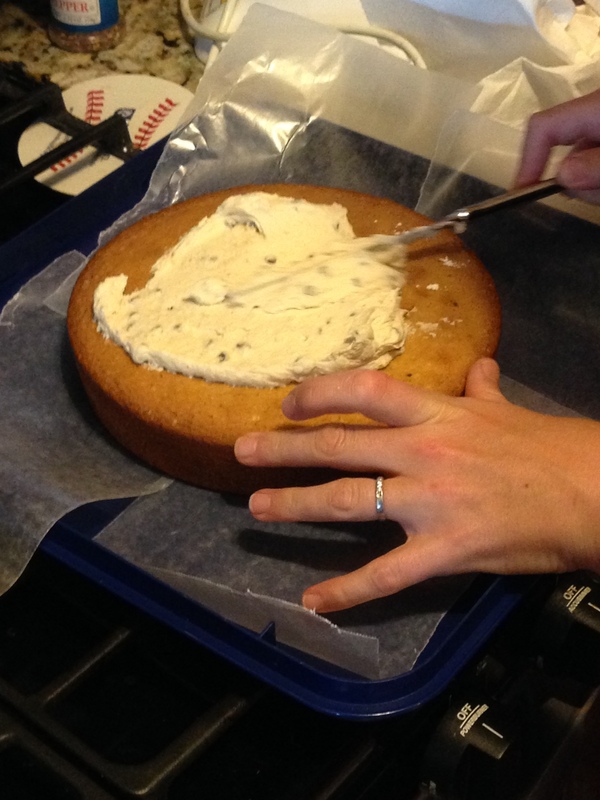 For the cake: Split vanilla bean and scrape out seeds. Place bean and seeds in a medium saucepan with the butter over medium-high heat until the butter begins to brown and smell nutty. When the butter is a rich brown color, remove the pan from the heat. Remove the vanilla bean, and place the melted butter in a container. Refrigerate until butter has re-solidified (probably more than an hour). Preheat oven to 350 degrees. Butter and flour two 9″ round pans. Place solid brown butter in a stand mixer. Beat on medium speed until creamy. Add sugar and beat until fluffy and smooth. Add in eggs and egg yolks, one at a time, beating each time until incorporated. In a separate, medium-sized bowl, combine flour, baking powder, and salt. Set mixer on low. Alternate adding the flour mixture and the milk in five additions (three flour mixture, two milk). Beat until just incorporated. Divide batter evenly between the two pans. Bake for 35-40 minutes, until a toothpick inserted in the center comes out clean. Let cake pans cool for 20 minutes before inverting cakes onto a wire rack to finish cooling. For the frosting: First make the cookie dough. Cream butter and brown sugar in a stand mixer. Add water and vanilla, mixing well. Add flour and salt, stirring to combine. Fold in chocolate chips and transfer cookie dough to a medium bowl. Refrigerate until ready to use. Now make the frosting. In stand mixer, cream butter. Add 2 1/2 cups confectioners’ sugar, salt and vanilla until combined, then add milk and continue mixing. Slowly add remaining confectioners’ sugar, mixing until well combined. Add cookie dough and mix until incorporated. For the ganache: Place chocolate chips in a large bowl. Bring cream to a simmer in a saucepan, then pour over chocolate chips and let sit for five minutes. Whisk until smooth, then chill for at least two hours to thicken. Frost cakes and top with ganache.